Slipped on water in Tesco – How Much Compensation Can I Claim? The first Tesco store opened in 1931 in Britain and has since grown into one of the largest multinational companies in the world. Although it began as a groceries store, it now sells all sorts of household goods as well as financial services, internet services and telecom services, becoming the supermarket that it is today. Accidents unfortunately can happen at any supermarket and with Tesco’s owning over 3000 supermarkets and smaller stores across the UK, it is no surprise that some slipping on water accidents may occur in their stores. 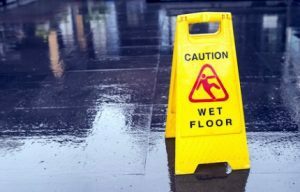 Regardless of whether you are one of Tesco’s employees or one of their customers, if you have slipped over whilst on Tesco premises because of water being on the floor and suffered an injury as a result, you may be eligible to make a Tesco slip claim. Tesco have a duty of care to their staff and customers to provide a safe environment for them to work in or do their shopping in. If they fail to uphold their safety policies and procedures and an accident occurs where someone gets injured, then they may be sued for compensation due to negligence, if the negligence can be proven. If you have suffered an injury whilst in Tesco from slipping on water and you believe you are entitled to claim for compensation, give us a call at Legal Expert and we can advise you on the best course of action to take. What is Tesco’s duty of care? What should you do after slipping in water at Tesco? Tesco slip, trip and fall injury claims. If I slip on water in Tesco, can I make a slip claim? How much compensation can I claim for a slip on water in Tesco? No Win No Fee Tesco Slip Claims. How to make a Tesco slip on water claim. Tesco, by law, need to have safety policies and procedures in place according to government health and safety regulations. They have a duty of care to their staff and customers to make sure that the safety policies and procedures in place are strictly followed to ensure a safe environment for people on their premises. Tesco needs to take all steps necessary to ensure the safety, health and wellbeing of their staff. They have to legally obey the health and safety aspect of the employment law as well as the duty of care common law. It is also their ethical and moral duty to prevent any physical and / or psychological injury to their staff and to fulfil any responsibilities with any negligence or personal injury claims. Making sure the working environment is safe. Making sure risk assessments are undertaken when needed and that tasks are clearly defined. Giving the correct content and amount of training and giving feedback on performance. Enduring the working hours are not excessively long. Providing rest areas for staff to have their break. Providing protection of staff from harassment or bullying either from other members of staff or from outside sources to do with their work, for example, customers. Ensuring staff do not suffer from discrimination whilst at work. Giving staff the opportunity to voice concerns any time they need to. If an employer fails to do reasonably everything that they can to protect their staff, then they can be considered to be in breach of their duty of care. Employees have to be responsible for their own health and safety too and have the right by law to refuse to undergo a certain task if they fear it could put them at risk of injury without the worry of being disciplined. As with their employees, Tesco has a legal obligation to ensure the health and safety of their customers to the best of their ability. They have a duty of care to provide a safe environment in which their customers can shop. Any hazards that may have been created in Tescos like spilt water, needs to be cleared and corrected as soon as possible, to prevent accidents and potential harm to their customers. If a customer was to slip on a spillage whilst in Tesco, for example, and suffer an injury Tesco would be regarded as being in breach of their duty of care, and so be liable if a personal injury claim was brought against them. However, they can only be in breach of their duty of care if they had neglected to clear the hazard within a reasonable amount of time. In other words, if a customer spills water and another customer immediately slips over, Tesco would not be deemed liable as they wouldn’t have had any chance to clear it up, but if it was something that was spilt and Tesco had, had a reasonable amount of time to notice and clear it up then they would be liable and in breach of their duty of care. If you are a member of staff at Tesco or a customer, and have sustained an injury because you slipped on water in Tesco, you may be able to make a compensation claim against Tesco for their negligence. In order to make a successful claim, as the claimant, you would need to be able to prove that Tesco was liable for your injury because of negligence meaning they had breached their duty of care. Contact us at Legal Expert if you are unsure about your eligibility for making a Tesco slip and slide compensation claim and we will try our best to assist you. Medical Report – Firstly, you should see a medical professional to get your slip and fall injury assessed properly and treated. This is obviously important for your health, but equally, is important for you case as a medical report will be made that will document your injury, severity, treatment, and expected recovery time. Witnesses – Try to take down the details of any witnesses in Tesco’s of your accident. Witness statements are great for backing up your claim and strengthening your case. Photos – Take photos of any injuries you have sustained due to your Tesco slip as these will provide visual proof of your pain and suffering. Extra Expenses – Keep a record of any extra expenses you have incurred as a direct result of your Tesco slip and slide accident. These may include medical costs, travel costs, prescription fees etc. Report – Ensure that the accident has been recorded in Tesco’s accident book and ask for a copy. Notes – Write down everything you can think of about when the accident took place. There may be something that is important to your case that you risk forgetting if it is not written down. All of the above will act as a form of evidence supporting your Tesco slip claim. Slip on water in Tesco injuries may vary from being fairly minor to more severe and possibly with a permanent disability, it would really depend on the circumstances and sometimes even the injured person’s state of health at the time. For example, if someone with osteoporosis was to slip over on water, they are more likely to break a bone than someone who doesn’t suffer with osteoporosis. If the accident is due to Tesco’s negligence of their duty of care, then you can make a compensation claim, regardless of whether you are an employee or a customer. Just give us a call and we’ll get the ball rolling to get you the compensation you deserve. If I slip over on water in Tesco, can I make a slip claim? Tesco have a responsibility to ensure the safety of their staff and customers. If you have slipped on water in Tesco and sustained an injury as a result, then you may be eligible to claim compensation. If the Tesco slip was due to their negligence and this can be proven, then your claim will likely be successful. Compensation claims can sometimes be a complicated process and so getting legal advice can be really useful. Legal Expert is a team of highly experienced solicitors that specialise in personal injury claims that would gladly help you get the compensation you deserve. There are a number of items that you should include in your compensation claim such as those listed below. Loss of earnings – The amount of income you have lost as a direct result of your injury sustained after your Tesco slip and slide accident should be claimed for as well as the amount of potential future income too. General Damages – This refers to the compensation you should be awarded for the pain and suffering you have experienced from your injuries. Care Claim – If you have needed help around the house whilst you recover from your injury, the person that has cared for you may make a claim. Medical Expenses – You can include in your claim any medical expenses that you have had to pay out due to your accident, such as prescription fees, treatment costs etc. Travel Expenses – Any extra travelling costs that you have had to pay as a direct result of your injuries sustained in the accident in Tesco, any vehicle adaptions or any alternative travelling costs should be included in your claim. Every compensation claim case is different as there are so many variables that can all affect the amount awarded, and so it would be impossible for us to be able to give an exact figure if you were injured by a slip on water in Tesco. In the table below, we have listed the average payout amounts for different injuries and the severity of the injuries. This may be used to get an idea of what you may possibly be awarded for a particular injury, but of course it doesn’t include the other costs and issues such as those mentioned earlier that may be claimed for as well. Don’t be alarmed if your injury isn’t listed, just give us a call and we can shed some light on what the average amount awarded is for your particular injury. Minor injuries Few hundred pounds - £525 Recovery within 7 days. Minor injuries £1,050 - £1,860 Recovery within 3 months. Pain and suffering £1,000 - £200,000 This refers to the severity of the pain and suffering endured and determines how much the claimant will be awarded. Minor Knee injury £4,750 - £19,600 Damage to the knee that is short term causing pain and loss of function. Moderate Knee injury £22,250 - £33,200 Longer term damage that causes ongoing pain and loss of function. Severe knee injury £39,700 - £72,970 Permanent damage and loss of function to one or both knees with ongoing pain and suffering. Minor back injury £350 - £9,850 Temporary damage to the back which gives short term pain. Moderate back injury £8,750 - 30,750 Further damage to the back with ongoing pain that is long term. Severe back injury £29,750 - £123,300 Loss of motor function and also possible Paralysis. Wrist injury Minor - severe £2,550 - £44,500 Small sprains that causes short term pain, to loss of function of one or both of the wrists and ongoing pain. Minor Elbow injury £3,100 - £9,750 Slight loss of function and pain that is short term . Moderate Elbow injury £11,400 - £23,900 Semi loss of function of the elbow causing pain. Severe Elbow injury £29,200 - £42,250 Complete loss of function of the elbow that may need surgery. Minor Shoulder injury £350 - £6,700 Arm movement is limited short term. Moderate Shoulder injury £6,250 - £9,750 Arm function is restricted. Severe shoulder injury £9,500 - £37,000 Extremely limited movement and some numbness of the arm. Surgery may be needed. Head Injury - Minor £1,500 - £9,500 Brain damage has not occurred and a full recovery is expected. Head Injury - Moderate - Serious £12,500 - £200,000 Head injury that has caused mental disability, loss of movement in arms and legs, and a change in personality. Head Injury - Very Serious £215,000 - £310,000 Severe brain damage, in a non-responsive, vegetative state. Loss of earnings £10,000 - £400,000 Depending on the claimants pay grade, there may be a chance of being awarded more than £400,000. It would also depend on future prospects and potential earnings. Loss of benefits £5,000 - £500,000 This amount gets based around the claimants current pay grade. As above, there is a chance of being awarded more than £500,000. The money awarded is based on the actual amount of income lost. As already mentioned, the figures in this table are just average amounts that people have been paid in compensation for particular injuries. The amount you get awarded generally isn’t just for the injury itself though, but also for all the areas of your life that it may have affected and possibly continue to affect if the injury sustained was more severe injury. Give us a call to make a start on your compensation claim. At Legal Expert, our team of solicitors all work on a No Win No Fee basis. What this means is that there are no upfront legal fees or any legal fees throughout. We get paid only if we win your claim for slipping on water in Tesco. Our payment is made by us taking a small percentage of your compensation amount when it is awarded. If in the unlikely event we lose your case, we swallow any legal costs ourselves, you do not owe us anything. This way there is no financial risk for our clients and we feel it also gives our clients the confidence that we will work hard on their behalf to get the best and highest compensation amount that we can for them, as after all, our wages also depend on the outcome. You could choose to go with a pay by the hour solicitor, but they will want paying regularly so you need to be financially able to do this, and they will want paying regardless of the outcome. In other words, you may pay a solicitor lots of money for legal costs, and with no guarantee of a successful claim, you could end up worse off than before you started your claim. Or you could run out of funds before your claim is concluded, again leaving you worse off than before you began. With our No Win No Fee way of working, there is absolutely no financial risk for you whatsoever, you can only gain from it, don’t hesitate to ring us for more information. If you have slipped on water in Tesco and suffered an injury as a result, you may want to start a compensation claim. Please don’t hesitate to give us a call at Legal Expert on 0800 073 8804. Your call will be answered by a member of our team of personal injury claims specialist solicitors and you will be offered a free consultancy session at a time that is convenient to you. During this session you have the opportunity to ask us as many questions as you need to regarding making your claim so that you feel more comfortable with the process. We will also use this time to ask you some questions so that we can begin to build a good, solid case for you. We also offer a free local medical if we feel it will benefit your claim but we can discuss this in more detail during the consultation. Once we have all the details we need, with your go ahead, we will start the proceedings to claim compensation for you on the No Win No Fee basis mentioned earlier. We really care about our clients and will endeavour to move your claim forward as quickly and efficiently as we can and will keep you informed every step of the way, without being bothersome. You can trust us to fight your corner for you so that you can concentrate on your recovery. We will do our absolute best to get you the maximum compensation payout amount that you’re entitled to. This is the HSE (Health & Safety Executive) site that gives information about the health and safety in the retail industry. This website gives information about common risks and how to manage them. There is also a risk assessment tool that may be handy for smaller businesses. This shows slip and trip accident statistics. Slipping or tripping over is the most common work place accident. The statistics are for the year 2016-2017. This is another of our guides regarding slips, trips and falls that may be of use. This guide goes into a little bit more detail and is about slip, trips and falls generally in any public place where someone else is accountable. This link leads to our guide regarding our No Win No Fee way of working. This gives a more in depth look at how the No Win No Fee way of working is beneficial and a bit more insight into how it works.